Panthers walk on field before Cure Bowl. 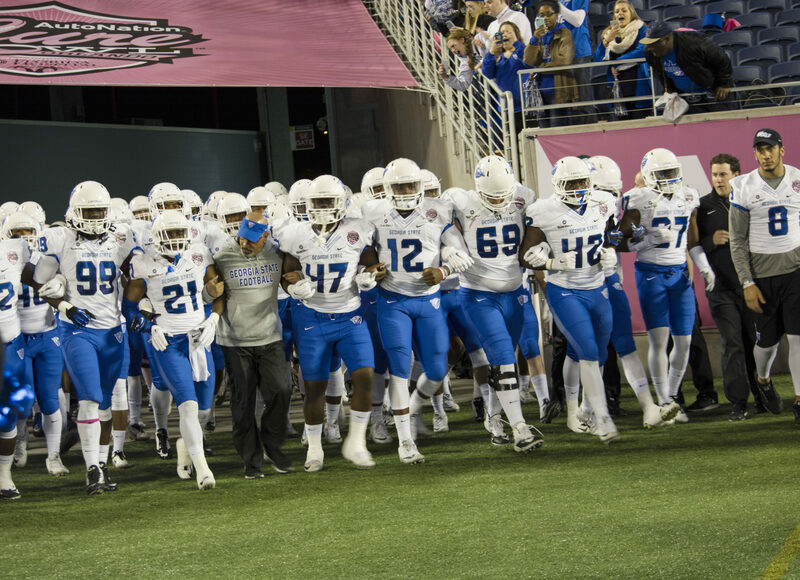 After three days, seven rounds and 253 selections were made in the 2016 NFL Draft, not one Georgia State prospect was chosen. However, shortly after the last selection was made, many Panther seniors announced the teams that signed them to contracts for next weeks rookie camps. Kicker Wil Lutz and wide receiver Donovan Harden will join the Baltimore Ravens. Cornerback Bruce Dukes will be heading to the Kansas City Chiefs, the organization that fellow former Panther Albert Wilson calls home. Safety Tarris Batiste announced on Facebook, that he’ll try to continue playing in the Georgia Dome, as he has accepted the Atlanta Falcons offer to rookie camp. Quarterback Nick Arbuckle signed with the Pittsburgh Steelers. 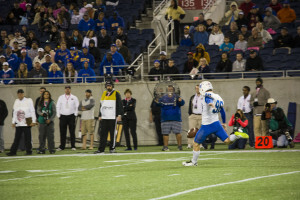 Wil Lutz kicking off after a Georgia State drive during the Autonation Cure Bowl. In 2015, Lutz was a nominee for the top punter in the country honor, which is the Ray Guy Award and he also made a career long 53-yard field goal in the 2013 season against Alabama. “Today I took one step closer to making my dream a reality. I’m a Raven! #MammaIMadeIt,” Lutz tweeted after his signing. Coming off of a first team All-Sun Belt junior season, Harden still averaged 72.5 yards a game dealing with foot issues at the beginning of his senior year. Dukes grabbed his first career interception in the Cure Bowl against San Jose State. Batiste may be most known for his game against Georgia Southern in 2015, where his eight tackles, two interceptions, two tackles for losses and forced fumble helped clinched the Panthers first Bowl Game berth. Batiste was also recognized as the FWAA AutoNation National Defensive Player of the Week for his performance against the Eagles. 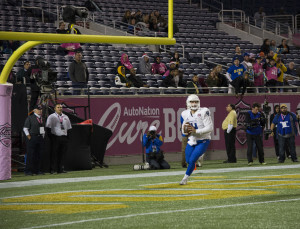 Nick Arbuckle in the end zone warming up before Cure Bowl. The Signal Athlete of the Year Arbuckle finished No. 7 in the FBS standings for most passing yards in the 2015 season. He currently holds the school records for passing yards (7,651), pass completions (566), completion percentage (.619), touchdown passes (51), total offense (7,566), and touchdowns responsible for (59) in his two years at Georgia State.